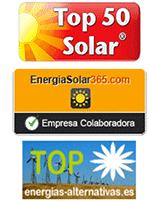 > Solar Energy>How much does a solar installation costs for a home? How much does a PV system costs for a home? The price of installing solar panels on a home varies depending on many factors. For example if we want to have a solar hot water installation, the price for this will depend on the geographic area where the house is located, the type of solar collector is used or the use we want to give. Another important factor is whether the solar installation will be in a townhouse or a small apartment building and the installation cost decreases as the surface of it grows. If we have to give an estimate, we could say that a square meter of solar panels varies between 700 € and 900 €. What savings accounts have a solar energy at home? According to experts in renewable energy, representing savings have an installation of solar panels at home for hot water and heating is about 150 € a year, that regardless of the repeated increases swelling the bills for gas and light year after year and that could make that figure was even higher. If we have photovoltaic panels that can last up to 25 years in operation prefect, the result is to invest in solar energy for domestic consumption is a very good idea.